Along SE 122nd Avenue in Powellhurst-Gilbert, police cars block neighborhood streets off in outer East Portland as they look for a parole violator. 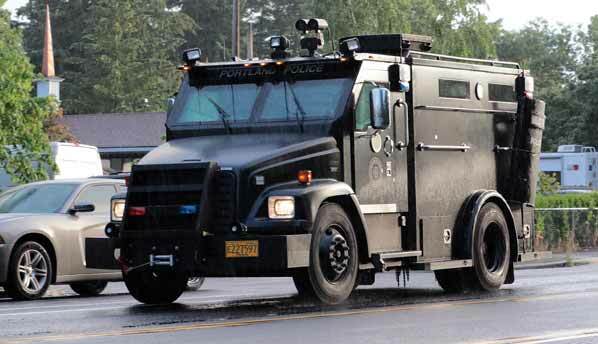 A felon on the run did his best to flee from and duck US Marshals and Portland Police Bureau (PPB) East Precinct officers, in the early evening hours of June 24. 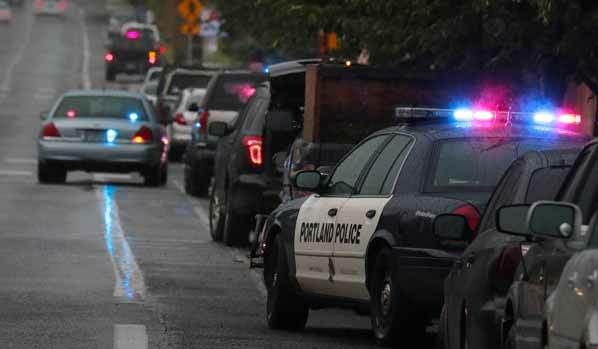 At first, a handful of PPB units started searching the area from SE 118th to 122nd Avenue, and from Holgate Boulevard to Schiller Street. Looking west on SE Pardee Street, officers lock down they area. An hour later, their numbers swelled to 32 officers, all looking for an African American male in his 20s, whom they said had a warrant for parole violation, on an original charge of Robbery in the First Degree. Light showers occasionally turned to heavy rain – but then the sun peeked through, as the PPB Special Emergency Reaction Team (SERT) and Crisis Negotiation Team (CNT) rolled into the area. 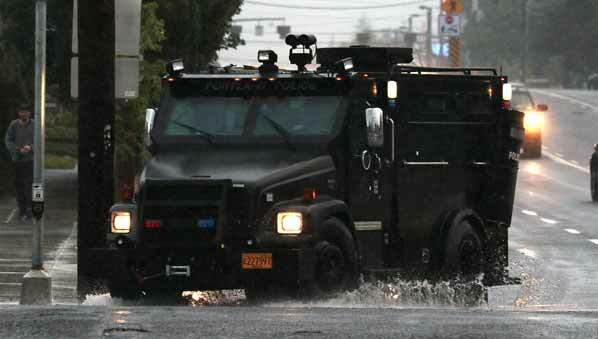 The armored SERT personnel carrier turns on SE Holgate Boulevard. 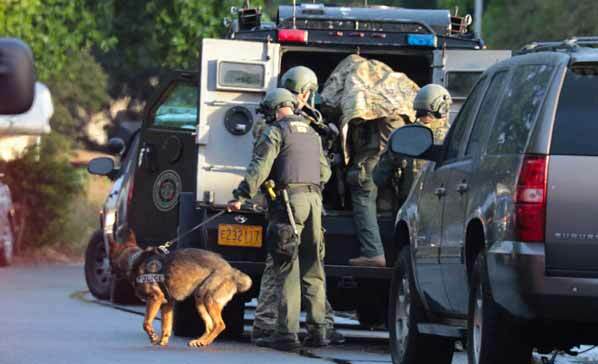 This K9 team joins other SERT officers to search for the potentially dangerous parole violator. 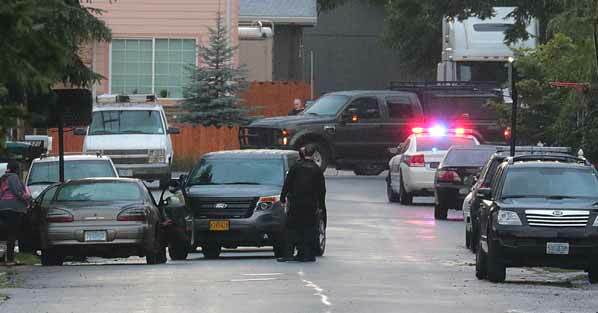 By this time, the focus of their search had turned to SE Pardee Street near 118th Avenue. “What has made the search more difficult is that, in this area of Powellhurst Gilbert, there are many long streets, large lots, and some of the streets are dead-ends,” said PPB Public Information Officer Sgt. Pete Simpson, just after the SERT officers had suited up and moved out. With officers prepared and armed inside it, the SERT carrier rolls out. Locating the fugitive trying to hide in the back yard of a house, the SERT officers moved in and took the suspect into custody without a struggle. Police capture 28-year-old Tony Lamar Brown, and return him to custody. At about 8:30 p.m., 28-year-old Tony Lamar Brown was in handcuffs, and the search was over. 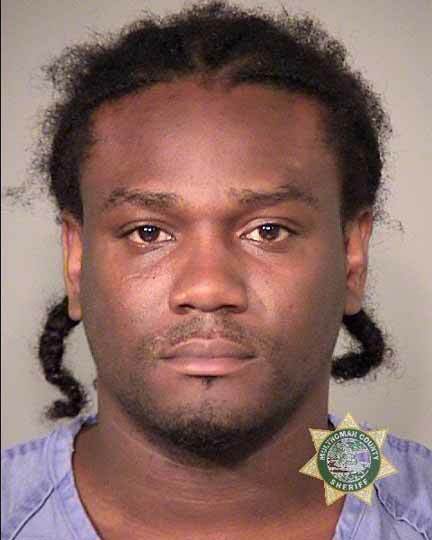 Brown was booked into Multnomah County Detention Center (MCDC) at 11:51 p.m. that evening on a parole violation warrant. After his arraignment the following day, Brown was moved to Inverness Jail, where he is being held without bail.